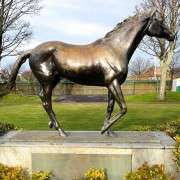 On April 8, 1967, the unfancied 100/1 shot ‘Foinavon' shocked the Nation with an epic win at Aintree. Defying the odds, Foinavon plodded to victory in the Grand National after all the other runners fell! Even after being gifted a massive lead, Foinavon was nearly outpaced at the finishing post, when many Jockeys who had fallen decided to remount and chase down the plucky no hoper. With a tendency to fall and a history of lackluster jumping, Foinavon seemed like a hopeless choice from the very start. A notoriously laid back horse, he once partook of a grassy snack after an unsuccessful jump over a fence that resulted in a fall. 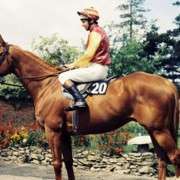 Foinavon already had been sold early in his career because of poor performance. Despite being trained in Ireland, the expected benefits didn't pan out. Anne, Duchess of Westminster, owned both Foinavon and Arkle, who was already a legendary winner. Despite a few high-profile wins, Foinavon didn't prove to be as worthwhile as Arkle to the duchess and he was sold. Subsequent owner John Kempton took it upon himself to make sure Foinavon gained confidence. He took the horse hunting and made sure he was led on daily jumps over a series of training fences. This patience paid off. Despite all odds and doubts about entering Foinavon into the Grand National race, history soon took its course. The Aintree Grand National course is the toughest test of horse and jockey in the United Kingdom. The race must be completed with agility, strength and courage. 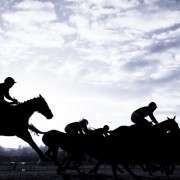 Foinavon had been compared to a plodding carthorse before, but managed to prove his doubters wrong this fateful day. The on course bookmakers offered the Aintree crowd odds of 100-to-1 on Foinavon that morning and given his recent bad form and poor jumping ability the odds did not seem terribly generous. Even his owner did not show up to watch the race. On the day of the race, the jockey booked to ride Foinavon couldn't make the weight. He went on to ride another horse, and jockey John Buckingham stepped in. Many of the jockeys were off at full speed from the beginning. Foinavon started the race slowly, following Honey End, who was favoured to win that day. 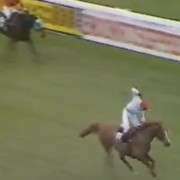 Fellow longshot Popham Down had just lost his rider and was continuing the race without a jockey. There were several race leaders at this point, including Castle Falls, Rondetto, Kapeno and Rutherfords. The main players were heading for the fence just before Canal Turn. At fence number 23 (or seven, depending on the circuit), a melee occurred that dramatically changed Grand National history. The fence itself is only four-and-a-half feet, one of the lowest on the course, but Popham Down was tiring and without his jockey onboard he veered violently to his right and slammed into Rutherfords. This started a domino effect, unseating riders and leaving the path strewn with downed jockeys and confused horses. 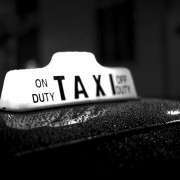 Despite the absolute calamity that lay ahead, Buckingham cleverly steered Foinavon around the mess. Clearing the entire scene, Foinavon rode hard and steady to finish the race in first place. Honey End's jockey, Josh Gifford, managed to jump again and gave Foinavon a run for his money, ultimately coming in second. Only 18 of the original 44 starters finished the race. 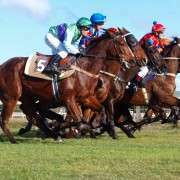 Foinavon gained worldwide recognition in one of the most legendary wins in the history of the Grand National. The fence at which Foinavon stole the race is now named in his honour.